Originally developed by Claude Shannon in the 1940s, the theory of information laid the foundations for the digital revolution, and is now an essential tool in deep space communication, genetics, linguistics, data compression, and brain sciences. In this richly illustrated book, accessible examples are used to show how information theory can be understood in terms of everyday games like '20 Questions', and the simple MatLab programs provided give hands-on experience of information theory in action. Written in a tutorial style, with a comprehensive glossary, this text represents an ideal primer for novices who wish to become familiar with the basic principles of information theory. "This is a really great book - it describes a simple and beautiful idea in a way that is accessible for novices and experts alike. This "simple idea" is that information is a formal quantity that underlies nearly everything we do. In this book, Stone leads us through Shannon's fundamental insights; starting with the basics of probability and ending with a range of applications including thermodynamics, telecommunications, computational neuroscience and evolution. There are some lovely anecdotes: I particularly liked the account of how Samuel Morse (inventor of the Morse code) pre-empted modern notions of efficient coding by counting how many copies of each letter were held in stock in a printer's workshop. The treatment of natural selection as "a means by which information about the environment is incorporated into DNA" is both compelling and entertaining. The substance of this book is a clear exposition of information theory, written in an intuitive fashion (true to Stone's observation that "rigour follows insight"). Indeed, I wish that this text had been available when I was learning about information theory. 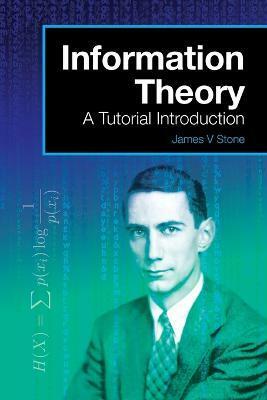 Stone has managed to distil all of the key ideas in information theory into a coherent story. Every idea and equation that underpins recent advances in technology and the life sciences can be found in this informative little book. " Professor Karl Friston, Fellow of the Royal Society. Scientific Director of the Wellcome Trust Centre for Neuroimaging, Institute of Neurology, University College London. "Information lies at the heart of biology, societies depend on it, and our ability to process information ever more efficiently is transforming our lives. By introducing the theory that enabled our information revolution, this book describes what information is, how it can be communicated efficiently, and why it underpins our understanding of biology, brains, and physical reality. Its tutorial approach develops a deep intuitive understanding using the minimum number of elementary equations. Thus, this superb introduction not only enables scientists of all persuasions to appreciate the relevance of information theory, it also equips them to start using it. The same goes for students. I have used a handout to teach elementary information theory to biologists and neuroscientists for many years. I will throw away my handout and use this book. " Simon Laughlin, Professor of Neurobiology, Fellow of the Royal Society, Department of Zoology, University of Cambridge, England.